For use in under-counter dishwashers and cabinet-type automatic utensil washers, Cascade Dish Detergent powers through greasy residue and stuck-on food, leaving dishes virtually spotless. It is equally as effective for pre-soaking pots and pans with baked-on soil. Using the power of Dawn Grease Fighting Detergent, Cascade rinses away grease and residue so you can enjoy your next meal on clean, spotless dishes. 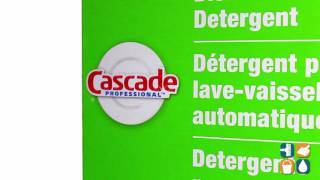 Order Cascade Dishwasher Detergent Powder today and save. Buy more and save more!